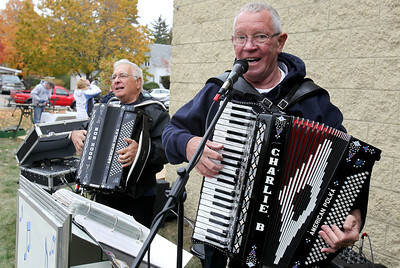 The McHenry County Historical Society Museum held the 35th annual Cider Fest Sunday, October 7, 2012 in Union. The annual event featured harvest demonstrations, displays and demonstrations of old tools, musical entertainment, barn raising, apple goodies bakery, white elephant sale and more. 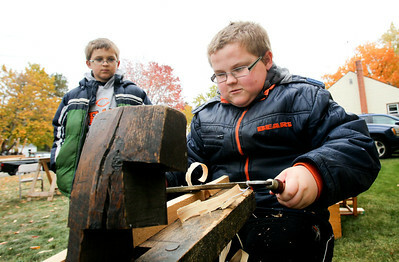 Mike Greene - mgreene@shawmedia.com Adam Parrott, 12 of Machesney Park, uses authentic tools to cut a wood board as his brother Alex, 11, watches on during the 35th annual Cider Fest Sunday, October 7, 2012 at the McHenry County Historical Society Museum in Union. The annual event featured harvest demonstrations, displays and demonstrations of old tools, musical entertainment, barn raising, apple goodies bakery, white elephant sale and more. Mike Greene - mgreene@shawmedia.com Jade Anderson, 2 of Union, eats an apple cider donut while listening to live music during the 35th annual Cider Fest Sunday, October 7, 2012 at the McHenry County Historical Society Museum in Union. The annual event featured harvest demonstrations, displays and demonstrations of old tools, musical entertainment, barn raising, apple goodies bakery, white elephant sale and more. 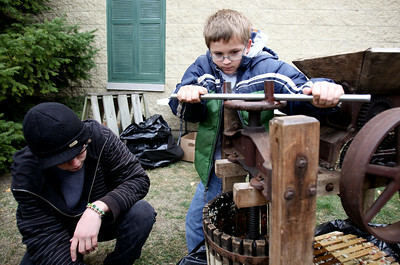 Mike Greene - mgreene@shawmedia.com Alex Parrott, 11 of Machesney Park, twists a machine to crush apples for apple cider as volunteer Nick Caldrone helps during the 35th annual Cider Fest Sunday, October 7, 2012 at the McHenry County Historical Society Museum in Union. The annual event featured harvest demonstrations, displays and demonstrations of old tools, musical entertainment, barn raising, apple goodies bakery, white elephant sale and more. 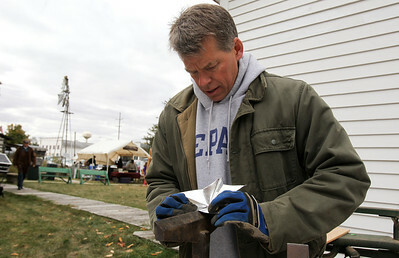 Mike Greene - mgreene@shawmedia.com Mid-West Tool Collectors Association member Scott Cochran, of DeKalb, demonstrates authentic tinsmithing during the 35th annual Cider Fest Sunday, October 7, 2012 at the McHenry County Historical Society Museum in Union. The annual event featured harvest demonstrations, displays and demonstrations of old tools, musical entertainment, barn raising, apple goodies bakery, white elephant sale and more. Mike Greene - mgreene@shawmedia.com Mid-West Tool Collectors Association member Norman Walzer, of DeKalb, sets a nail in a leather shoe while demonstrating authentic shoemaking during the 35th annual Cider Fest Sunday, October 7, 2012 at the McHenry County Historical Society Museum in Union. The annual event featured harvest demonstrations, displays and demonstrations of old tools, musical entertainment, barn raising, apple goodies bakery, white elephant sale and more. 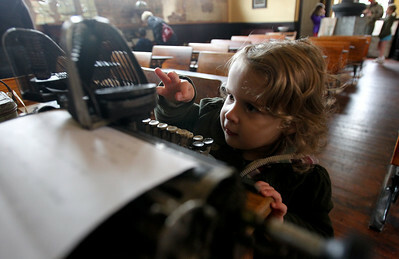 Mike Greene - mgreene@shawmedia.com Rachel Green, 2 of Union, types on an Oliver type writer in a restored school house from 1895 during the 35th annual Cider Fest Sunday, October 7, 2012 at the McHenry County Historical Society Museum in Union. The annual event featured harvest demonstrations, displays and demonstrations of old tools, musical entertainment, barn raising, apple goodies bakery, white elephant sale and more. Mike Greene - mgreene@shawmedia.com Elizabeth Martin, 9 of Marengo, pulls on the bell of a restored schoolhouse from 1895 as her sister Eileen, 6, watches during the 35th annual Cider Fest Sunday, October 7, 2012 at the McHenry County Historical Society Museum in Union. The annual event featured harvest demonstrations, displays and demonstrations of old tools, musical entertainment, barn raising, apple goodies bakery, white elephant sale and more. Mike Greene - mgreene@shawmedia.com Charlie Benedict (right) and Bob Hoge, of Charlie B and Friends, play for attendees during the 35th annual Cider Fest Sunday, October 7, 2012 at the McHenry County Historical Society Museum in Union. The annual event featured harvest demonstrations, displays and demonstrations of old tools, musical entertainment, barn raising, apple goodies bakery, white elephant sale and more. 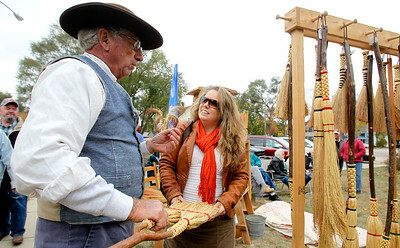 Mike Greene - mgreene@shawmedia.com Bob McCann, of Woodstock, explains a traditional broom he made with locally grown broom corn to Trisha Wiser, of Lake Zurich, during the 35th annual Cider Fest Sunday, October 7, 2012 at the McHenry County Historical Society Museum in Union. The annual event featured harvest demonstrations, displays and demonstrations of old tools, musical entertainment, barn raising, apple goodies bakery, white elephant sale and more. 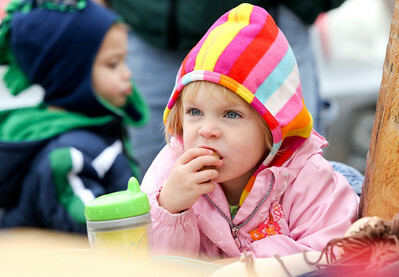 Jade Anderson, 2 of Union, eats an apple cider donut while listening to live music during the 35th annual Cider Fest Sunday, October 7, 2012 at the McHenry County Historical Society Museum in Union. The annual event featured harvest demonstrations, displays and demonstrations of old tools, musical entertainment, barn raising, apple goodies bakery, white elephant sale and more.